Product prices and availability are accurate as of 2019-04-20 12:12:38 UTC and are subject to change. Any price and availability information displayed on http://www.amazon.co.uk/ at the time of purchase will apply to the purchase of this product. We are delighted to stock the famous Talisker 18 Year Old Island Single Malt 45.8% 70cl. With so many available right now, it is good to have a name you can trust. The Talisker 18 Year Old Island Single Malt 45.8% 70cl is certainly that and will be a superb acquisition. 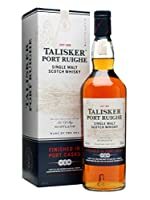 For this great price, the Talisker 18 Year Old Island Single Malt 45.8% 70cl comes widely respected and is always a popular choice with lots of people. Talisker have included some excellent touches and this results in great value. This is rich and fruity with Victoria plums greengages and a little dried orange peel alongside some butterscotch and a thread of smoke behind. Very complex. With a little water maritime characteristics emerge - dry boat varnish edible seaweed. It is still sweet but now joined by notes of iodine and the smokiness of an un-struck match. Perfection.